One of the most significant technical innovations deployed on large yachts, but likely to be used very soon also on smaller boats, is the Intruder. These devices for controlling stability were created by the Rodriquez Marine System for application on large fast boats although their effectiveness has also been demonstrated on leisure craft. To get to know more about them we went to Pietra Ligure, to the company's premises. There we met Alessandro Cappiello, Managing Director of the Rodriquez Marine System, who explained and showed us how they work. First of all I'd like to know how the introduction of this system came about. What was it that prompted you to design it? As I'm sure you know, the Rodriguez group is renowned all over the world because it designs and builds fast ships for transporting passengers. At first, during the seventies, Rodriquez was successful in the production of excellent hydrofoils and then, more recently, this success has been repeated for the construction of the so-called "fast ferry". These are boats that wève all come to know and appreciate because they have set new rules for transporting passengers by sea by guaranteeing considerable speed and an exceptional level of comfort on every sail. 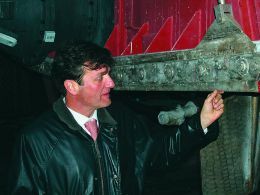 To achieve this Rodriquez has always invested a great deal in research and with this in mind created the Marine System which has not just been engaged in specific systems but has also, over time, developed a whole series of technologies aimed at raising the overall seaworthiness of each boat produced, contributing to their propagation and therefore to the Group's success. The Intruder began in this context, i.e. in our case commercial shipping, and it later flowed into other environments, which for us means leisure craft. It's something like what happens in the car world where research and technological development are carried out for competitions, for Formula 1, but then it is the whole sector that reaps the advantages, right down to the normal cars that we see on the roads. But what was the need that prompted you to research stabilising systems which varied from traditional ones like the flap? Equipping our boats with efficient flap systems was extremely difficulty mainly because the stern transom of a fast ferry is largely taken up with propulsion and control organs that are especially bulky so that it is practically impossible to install any type of traditional appendix. For this reason, together with Rodriquez Engineering, we studied alternative systems, finally coming up with the Intruder. What does it have that is different from a flap? To simplify the concept, we could say that it is a plane, let's say a kind of metal blade, that descends parallel to the stern transom and protrudes from the line of the underbody. This blade deviates fluid threads, thus creating a hydrodynamic wedge which generates, in turn, a hydrodynamic thrust from bottom upwards to the stern of the hull. The projection of the blade varies the forces generated on the bottom of the hull and so the stern is raised and as a result, the bow of the ship drops, achieving the ideal longitudinal trim for sailing. Obviously the Intruder can be used also as a transverse trimming tab by altering the immersion of the blades connected to an electronic control system, and is therefore also an excellent system of roll damping on fast boats. Optimal trim is our objective but it is also the starting point of our work. In fact, first we carefully study the hull underbody on which we have to install the system, then we calculate its best sailing trim and then we begin the work of design, keeping this information as our "target". Explained like that it seems really simple and functional but, in this regard, is it more or less efficient than a traditional flap? In our opinion it is superior both as a longitudinal and transverse trim tab. We have, for example, collected a heap of data on roll in sailing which is very comforting. I'll give you an example: with a 4 sea at certain speeds, without Intruder the boat "designed" rolls of 6 and a half degrees; with our system this factor went down to 1.5 with over 75% less of a list. If then, to the Intruder we add also the system of stabilising fins, the boat becomes really stable. But does this blade that obstructs the flow of water not offer more resistance than a flap? No, it is absolutely more efficient even from this perspective. Calculate that the projection of the blade, even on a large ferry sailing at 30 or 40 knots, is limited to a few centimetres, sometimes even less and so the braking effect which in any case is less than that of the paddle of a flap, should be considered a minor thing compared to the advantages reaped. Also, our system does not really constitute just one plane. The Intruder is really made up of two "flood gates" that slide inside two steps made with Teflon walls. 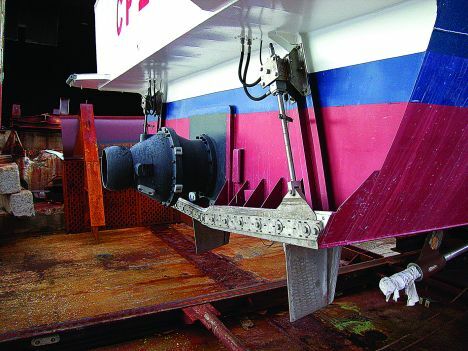 The tip of each blade, the one towards the centre of the underbody is fixed, hinged to the stern transom, while the other tip is connected to a piston that, with a continual movement, regulates its projection. So the two surfaces are totally independent one from the other also as regards their incidence just like flaps. Also when the boat is listing, perhaps because the sea is athwart to starboard, by acting mainly on the port system the boat recovers its trim. Also on leisure craft it's the same, except that the power centres are less complex. At Rodriquez Marine System we have a department engaged only in planning electronic control systems from the points of view of both hardware and software and I can assure you that also in this specific sphere our know-how is really avant-garde. Perhaps this is also the aspect that makes our Intruders stand out from other similar devices. Also in this case the initial studies were done for fast ferries with all the difficulties relating to the incredible number of functions, elements and variables to be controlled on these ships. 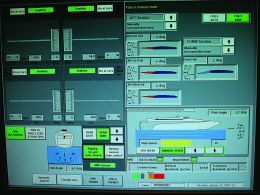 For this reason we made more complex and powerful power centres to automatically and continually monitor the whole ship, acting on each element and optimising regulation to achieve ideal sailing. Everything is extremely rapid, much more than the traditional flap system, and practically continuous, also because if it were not, the whole "apparatus" would lose much of its effectiveness. The period of oscillation of a boat that rolls is, everything considered, short - a few seconds - and the hull passes from one peak to another. If there were a delay in the corrections we would risk making adjustments that instead of damping the movement would have the opposite effect and would therefore worsen the boat's behaviour. And if the power centre goes haywire? By means of a "touch-screen" type monitor placed in the bridge, an operator can see and if necessary alter each single parameter, correcting any defects in the system. Yes. For the moment the Intruders have been assembled on the first example of Leonardo 98 made by the Azimut shipyard. There they "work" coupled to a system of stabilising fins with excellent results. The control unit installed on board is certainly simplified compared to the ones we assemble on ships, also to keep costs down, but it is complex nevertheless and just as efficient. Therès a smaller control panel for interfacing with the system so that interventions can be made if required, or it can be left to handle the trim tabs by itself. But how much does an Intruder system cost? As regards prices we're in line with, or just a little bit over, other more traditional systems but there is a better performance from ours, it is easier to use because it is electronically controlled and easier to install with just skin and bones maintenance. But is the Intruder effective only on large fast boats? Absolutely not. Actually I believe our system has the right characteristics for widespread use on smaller fast motorboats.